Sofrito is the secret ingredient in many Latin Caribbean dishes, and it's easy to make. It's a versatile, aromatic puree of tomatoes, peppers, cilantro, onions, and garlic. You may use a food processor or blender to get the desired results. 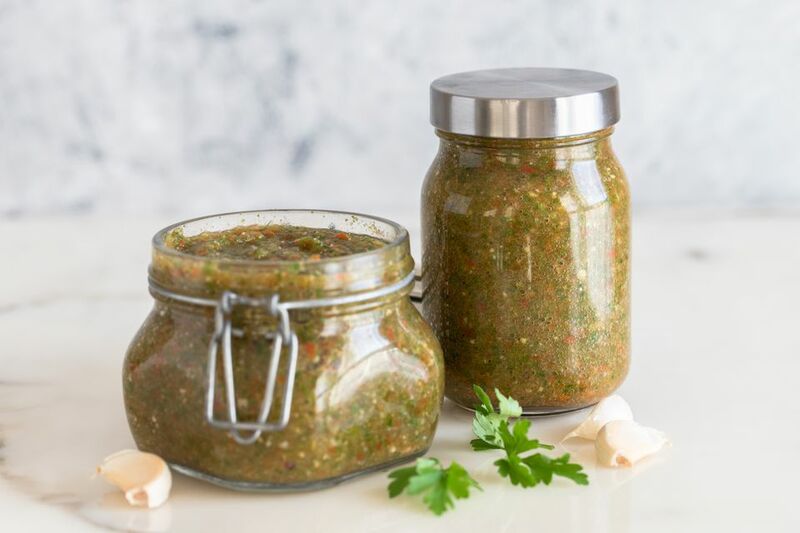 During harvest season, you can use your garden produce or buy it at the peak of flavor from the farmers market to make and freeze sofrito for use throughout the year. Spending just a little time in the kitchen will be a good investment for having your additive-free sofrito to use in your recipes. You'll need a knife for chopping, a cutting board, food processor, and storage jars for this recipe. This variation doesn't require any cooking. The word "sofrito" is Spanish and means to lightly fry something, such as by sauteing or stir-frying. But this will refer to how it is used rather than how it is made. It's often the first thing to go into the pan or cooking pot, and at that time it can be lightly sauteed to bring out the flavors of the aromatics. Peel the garlic and onion and chop, along with the other ingredients, into sizes that are small enough to fit into a food processor ​or blender. You don't have to dice them finely as you will be processing them. Focus on removing the seeds and any tougher stems that might leave grit in the finished sofrito. Place the chopped ingredients into a food processor or blender. You can process in batches if your food processor isn't big enough to accommodate it all at once. Blend all ingredients well. You want the finished sofrito to be finely processed. If you're not familiar with sofrito, think of it being the consistency of pesto, a thick paste. Once blended, your sofrito is ready to use. For immediate use, store the sofrito in a glass container. Plastic containers are not ideal because plastic will absorb the odor of garlic and onions. Use the sofrito with rice, stews, beans, or protein and enjoy. If you find it necessary to add liquid, you may add water or olive oil a tablespoon at a time while blending. Use as little liquid as possible, because you don't want the sofrito to be too runny. The tomatoes will provide some juice, so you may want to ensure they are in the mix before adding any liquid. For future use, you can freeze the sofrito to use at any time. Depending on how much you use in a recipe, you may want to freeze it in 1/4 to 1/2 cup portions or freeze it in an ice-cube tray for 2-tablespoon cubes. After the cubes are frozen, place them in a freezer bag. They should be good for up to a year frozen. What Is Sofrito and How Do I Make It?